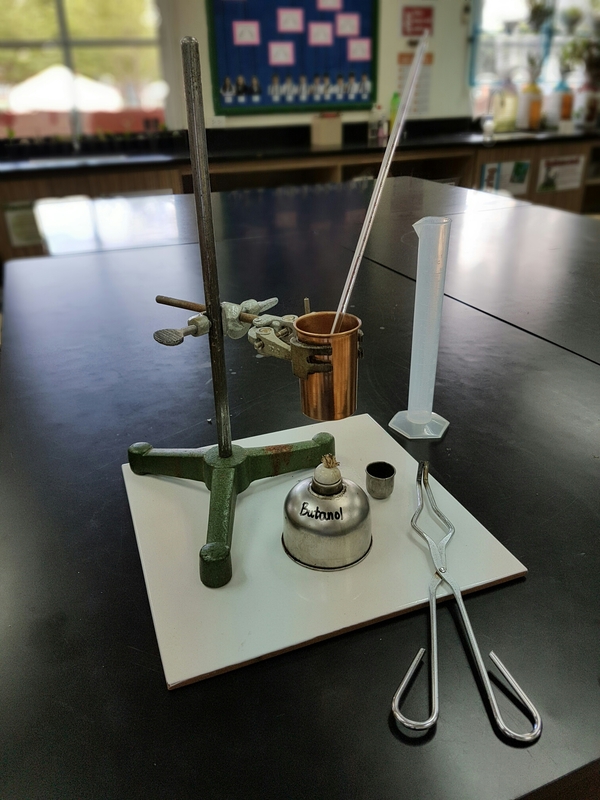 The purpose of this experiment is to determine the heats of combustion of a series of 5 primary alcohols, methanol to pentanol. In this experiment, you burn a measured mass of an alcohol in a spirit lamp and transfer the heat energy released to a calorimeter containing water. From the resulting temperature rise you can calculate the heat of combustion.In some earlier calorimetric experiments, you assumed that all the heat energy released in a chemical reaction was absorbed by the contents of the calorimeter. You cannot make that assumption in this experiment for two reasons. The heat energy is released in a flame, and although the apparatus is designed to transfer most of the energy to the calorimeter, a significant quantity is lost to the surrounding air. Arrange the heat of combustion apparatus, as shown in the diagram below. Adjust the height of the calorimeter so that the top of the spirit lamp is approximately 3cm above the wick. Use water at room temperature (not direct from the tap) to fill the calorimeter with 50cm3. Record the exact volume. Stand the spirit lamp containing methanol away from the calorimeter, and use a wood splint to light it. Adjust the height of the wick, using metal tweezers, to obtain a flame about 1 cm high. Weigh the spirit lamp, including the cap, as accurately as possible and record the mass in a Results Table. Stir the water in the calorimeter and record its temperature, to the nearest 0.5°C. Put the lamp under the calorimeter and light it. Slowly and continuously stir the water in the calorimeter and watch the thermometer. When the temperature has risen by about 10°C, extinguish the flame and immediately replace the cap. Continue stirring and record the maximum temperature of the water. Re-weigh the spirit lamp and cap and record the mass. Without removing the calorimeter from the stand, and holding both together carefully, pour away the water. If you have time, repeat the experiment to increase the accuracy. This second run should be much quicker because you should not need to make any adjustments (i.e. start at step 2). Before doing any calculations, repeat the experiment using ethanol, propan-1-on, butan-1-ol and pentan-1-ol, record the mass and temperature change in your results table. n=number of moles of fuel burned. Plot a Graph of your results with the fuels on the x axis and the energy change per mole on the y axis. What conclusions can be made from this experiment. (note: if the reaction is exothermic what should the sign of the energy value be?